A £48,000 investment hits the market this week providing a boost for traders and shoppers in Rotherham town centre. Proposals were approved by Rotherham Council earlier this year to extend the street market to Effingham Square, which was revamped as part of the £40m Tesco development, and is intended to attract customers and draw them from Tesco into the town centre retail area. Subject to availability, traders will be able to rent a stall from as little as £10, and it is expected these will be quickly snapped up as there is already a waiting list of traders wanting extra stalls. 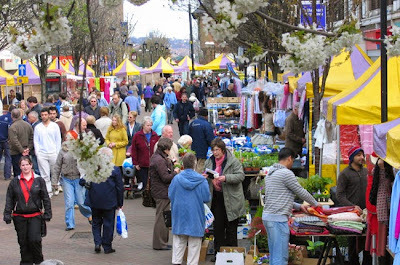 The Council is confident that the additional stalls will be fully occupied over the coming months. Cllr Denise Lelliott, avisory cabinet Member for housing and the local economy at Rotherham Council, said: "Tuesdays used to be very quiet in Rotherham but now they are one of the busiest days of the week. This latest investment in the street market by the Council will give even more choice and value for money for visitors to the town centre and the markets in particular. Over four million customers supported the Centenary Market Hall last year." One the UK's largest importer and exporter of tents, marquees and pop up awnings, Gala Tent, has secured the contract to refresh the market. The existing 62 gazebos for the street market have been replaced and an additional 33 purchased to create 95 trading areas. To cover the cost of the street market extension the authority is borrowing from the Public Loans Board over a five year period, with the repayment being covered by the estimated additional income generated from the market. The initial capital expenditure is around £48,000 with an estimated £25,000- £53,000 of income from renting the new stalls per annum. Founded in 1999, Gala Tent now sells over 10,000 tents and marquees each year, along with around 90,000 event accessories and furniture products. In the UK, the Manvers-based company is a preferred supplier for organisations including the military, NHS, the South Yorkshire Fire & Rescue Service, South Yorkshire Police Service, St John's Ambulance and AA. Darren Perry, sales advisor at Gala Tent, said: "It's fantastic to be able to support local councils and traders, and see our products benefit our local markets. We are delighted to be a part of this project and we hope the traders enjoy using our products. We stock nationally to a lot of other street food and market traders, so we hope that our community can see the benefit of using a pop up gazebo and share our enthusiasm to be working together."